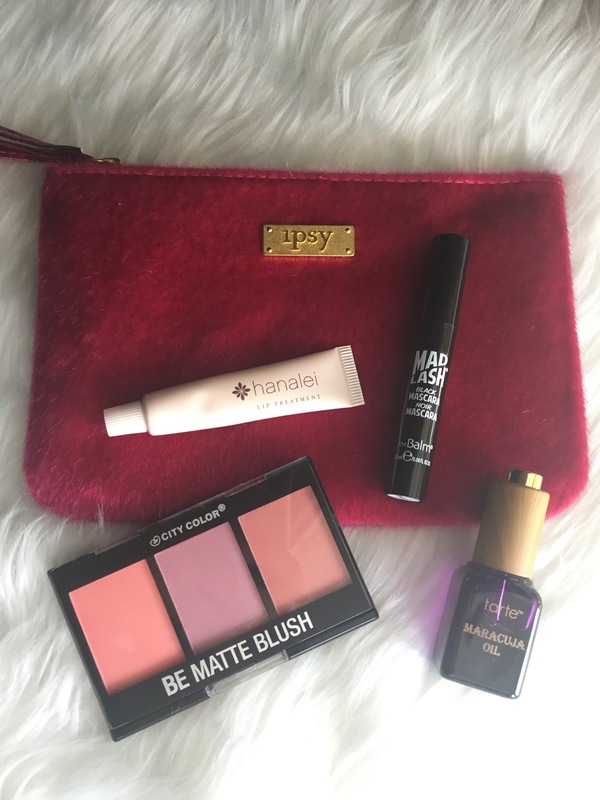 I am really happy with the products I received in my Ipsy bag this month! The only product I didn’t like was the knock-off Beauty Blender (not pictured) and I gave it to a friend. I also think the faux fur bag is adorable! Keep reading to see a more detailed review of what I thought of each product! Hanalei Lip Treatment- this stuff is pretty much a kicked up version of Aquafor, but I love it! It smells like coconut and tastes pretty good too, not gonna lie 😊. It has a really thick consistency and does a great job of moisturizing my really dry and chapped lips (thanks to the colder weather). A little bit goes a long way, so this little sample will last a while. The Balm’s Mad Lash Black mascara- I only tried out this mascara once, but I really liked it and it did a pretty good job of adding length and volume to my lashes without clumping them together. I don’t think I would go out of my way to purchase the full size product (I just love my drugstore mascaras), but it’s a good product and I will continue to use the sample! City Color Be Matte Blush palette- I am so glad that I received this little mini blush palette in my bag! I love all the colors and they are nicely pigmented without being too powdery. I love how small and compact it is, so I can throw it in a little makeup bag and still have three good blush options. Tarte Maracuja Oil- I have been wanting to try this oil for the longest time, but just didn’t want to spend the money on it. This is the product that I was most excited to receive in my glam bag and I can’t wait to use it on a regular basis. It is a clear, thin oil so it can easily be mixed with foundation or other cream makeup products. For me, it is really hydrating without being too greasy and soaks into my skin really nicely. MintPear Beauty Blending Sponge (not pictured)-unfortunately, this was the most disappointing product I received in my bag. I wanted to use it to apply my foundation today and when I went to dampen it, it did not expand and remained extremely dense and firm. I didn’t even bother using it because I knew it would not work for me, so I gave it to a friend before I remembered I needed to take a picture!